The Unsharp Mask node applies an unsharp mask filter to the input image. Unsharp masking (USM) is an image sharpening technique, often available in digital image processing software. The "unsharp" of the name derives from the fact that the technique uses a blurred, or "unsharp", negative image to create a mask of the original image. Image with a grow filter of 5 x 5 pixels. Drag the Unsharp Mask icon into the Node Graph. Connect the output of an image node into the image input in the Unsharp Mask node. 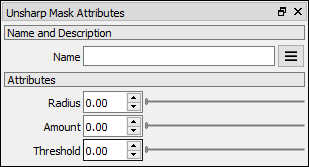 Adjust the attributes of the Unsharp Mask node to modify the output image. The Image to be sharpened. The radius of the blur filter.